Moly-Grease Plus™ provides superior lubrication and significantly reduces friction and wear to prolonging the life of your equipment. A multi-purpose lubricant formulated with Molybdenum Disulfide to sustain lubrication under extreme pressure and difficult operating conditions. 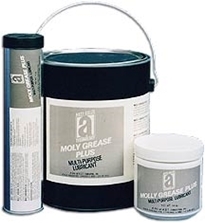 Moly-Grease Plus is a low-friction lubricant which guards against wear and galling on gears or splines operating under high load at low speeds. Applications: Gears, speed reducers using grease, anti friction bearings, cams, slides, sleeves, pump bearings, wood and metal working equipment, chassis, general maintenance.